The World is Wonderful! Welcome and thank you for studying geography, appreciating the world's marvels, and exploring GeoFact of the Day. The IUCN Red List of Threatened Species™ for SAN MARINO in Southern Europe lists no critically endangered species, two vulnerable species, and seven near-threatened organisms. The Aquatic Warbler bird and Opisthoteuthis calypso snail species are listed as vulnerable. These species are fortunately not as threatened as endangered and critically endangered species on the IUCN Red List, but they still are susceptible to human-related environmental changes. San Marino's near-threatened species are as follows: the Barbastelle bat, Bechstein's Myotis bat, Common Bentwing Bat, Common Otter, Mediterranean Horseshoe Bat, Red Kite bird, and Western Red-Footed Falcon. Do you have any thoughts or suggestions? Let me know with a comment! I greatly appreciate your input... thank you so much! Content, graphics, and the background are created by me (pseudonym: Wonderful World), except when I credit other sources. Wavy flag images (see Lesotho post) come from the public-domain Wikimedia Nuvola project — Facebook also uses these images. I do not copy and paste from other websites. Therefore, all posts are original but may sometimes include info, links, and/or images from credited external sources. To use a GeoFact of the Day Blog image for your website or project, write a comment below a post, and I will likely approve your request. Feel free to offer comments, suggestions, and compliments on any post or page! You can be anonymous. Note that spam comments with non-relevant links will be deleted. Thanks for your loyal readership on the one-and-only GeoFact of the Day! Thank you so much for accessing your trusted source for reliable geographic info since 2008 — today and always! Thanks for Visiting from Anywhere in the World! Like GeoFact of the Day on Facebook! GeoFact of the Day's author does not operate a Twitter page...sorry, tweeters! 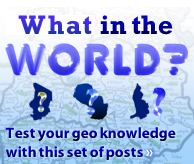 Visit GeoFact of the Day Blog's Newest Maps page and Maps post topic for more maps! Navy-blue text is hyperlinked for your convenience. A variety of 70s, 80s, 90s, 00s, & today on Slacker Radio! Original content © 2008—present, Wonderful World Blog Publishing. Powered by Blogger.